Meg's Food! | Sweet Potato and Spinach Lasagna with Tofu Ricotta - Meg's Food! A winter like this needs lots of comfort food. But unfortunately, comfort food usually isn’t the healthiest meal you can have. That’s why I love switching up comfort food classics but adding in tons of veggies and protein! This lasagna is a perfect example of comfort food made healthy. Instead of carb-heavy lasagna noodles, I’ve used very thinly sliced sweet potato. 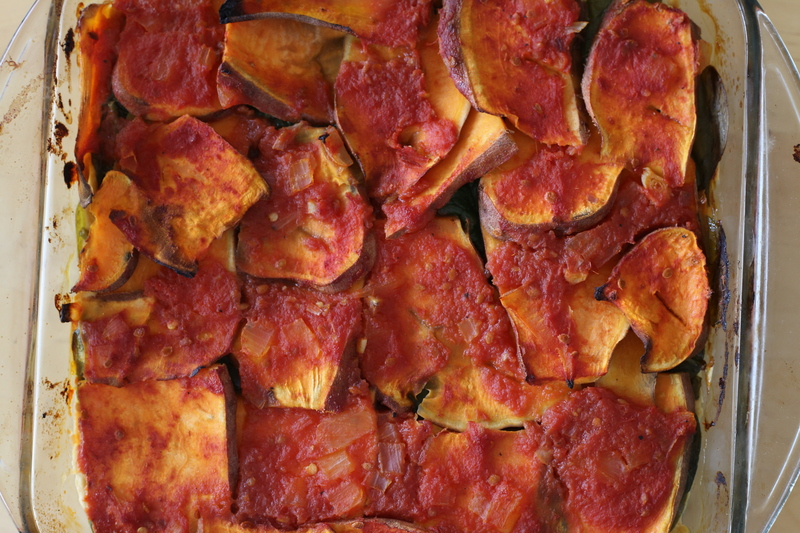 I’ve made similar veggie-based lasagnas before, like my zucchini lasagna, and my vegan eggplant lasagna, but I love the sweet potatoes here. They bake in the oven to a similar texture to al dente pasta, adding some great texture to this dish. I used a mandolin to slice the sweet potatoes, but you could use a sharp knife and some knife skills as well. Next, we need to make it vegan! That’s where tofu comes in. This recipe for tofu ricotta is so similar to ricotta in both taste and texture, no one will ever know you’ve made the switch. And unlike ricotta, tofu ricotta is low in fat and very high in protein. Win win! Tie it all together with homemade tomato sauce and lots of spinach. There are 3 servings of veggies in each serving, plus lots of protein and fibre. Preheat oven to 375. Using a mandolin or sharp knife, cut potatoes lengthwise into thin slices. Meanwhile, make the ricotta. In a food processor blend tofu until smooth. Add lemon juice and zest, nutritional yeast, salt, and chili flakes and blend until combined. Spread some tomato sauce on the bottom of an 8×8 inch baking dish. 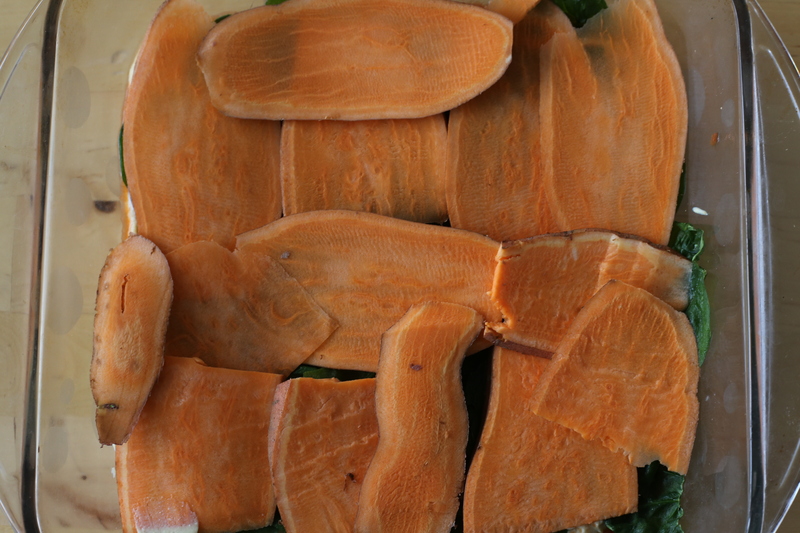 Top with a layer of sweet potato slices. Top with half the ricotta, and then one cup of spinach. Add another layer of sweet potato slices, the remaining ricotta, and the remaining spinach. Finish with a final layer of sweet potato slices and cover with sauce. Make sure the top layer is nicely covered, or the sweet potatoes will burn in the oven. You can top with vegan cheese shreds if you’d like. Bake 40-50 minutes, until sweet potatoes are nice and soft. You can cover with aluminum foil if the top is getting a bit crispy. This entry was posted in Dinner, Lunch and tagged comfort, gluten free, healthy, low carb, sweet potato, tofu, vegan, winter. Bookmark the permalink.